Choose from any of the classes below for your party or group! This Polish classic is a favorite in America too! We will make the dough from scratch and make traditional and modern fillings. We will cook them up with lots of onions and butter for you to sample and take home! On the menu: Sauerkraut and Bacon Filled Pierogis, Cheese and Potato Filled Pierogis, Mushroom and Ricotta Pierogis. We will be making everything we need to create mouth-watering broth, ramen noodles and different accompaniments - soft egg, pork belly, and pickled shiitake mushrooms. These are more than ‘sandwiches’ – they are flavor packed and wholly satisfying. Join us as we create and assemble these amazing dishes: Gua Bao – Soft buns filled with glazed slow roasted pork belly, pickled mustard greens, fresh cilantro, and peanuts and Bahn Mi – Baguette stuffed with tempura chicken, pickled daikon + cucumber, cilantro, mayo, peppers and paté. If you don't like scones it's because you haven't had a good one! And biscuits you buy, well that's another story.... Learn the techniques to make delicious, flaky, tender scones and biscuits in this fun class. We will make some to share and taste in class, and send you on your way with some to share (or hide!) at home. Who doesn't love a sweet, soft and cinnamon roll or sticky bun? You will learn about making sweet roll dough and then how to use this one master dough to make cinnamon rolls and sticky buns. Learn about yeast and how to use it, as well as proper proofing and baking techniques! We will make some to share and taste in class, then send you on your way with some to bake at home. Pâte à Choux, also known as Cream Puff Pastry dough, is a versatile dough used to make all kinds of delicate French pastries. We will learn how to make it and all the techniques for piping, filling and glazing to create delectable cream puffs, eclairs and cream filled swans. We will be making the pastry creams and cream fillings as well! The Coconut Cake from DOUGH - the one you heard about... or still dream about. We will make this classic and you will leave with a 9” - 3 Layer Coconut Cake. We will make the cake, the filling, and decorate this heavenly creation! Perfect to bring to friends, home or a party that same day! Bring your budding chef to this fun class - We will be making everything we need to create mouth-watering broth, ramen noodles and different accompaniments - soft egg, pork belly, and pickled shiitake mushrooms! This is a tasty one! Bring your young chef-to-be to this fun class! We will make the dough then hand toss our pizzas and then customize them with a bunch of fun toppings! 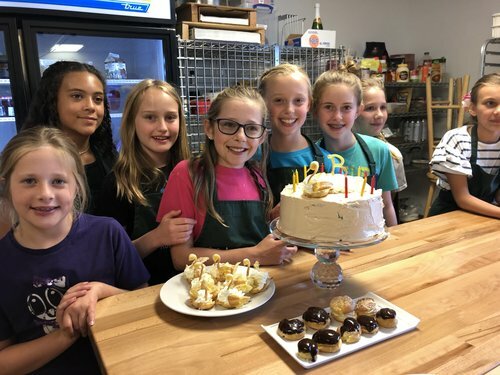 Host your child's next birthday party at The Asheville Kitchen! We keep the planning process as simple and enjoyable for you as possible. All you need to do is send the invitations and show up the day of the party to have a great time - and we do all the clean up! Ecco! Prepare to roll up your sleeves and get your hands working! We will making and eating fettucine and two sauces - creamy Alfredo and marinara. We will also make garlic bread knots and the kids will decorate Italian Cream Cupcakes to celebrate the guest of honor! Your birthday celebration should be special, lovely and delicious. In this class, we will make macarons from scratch and fill them with lemon, chocolate and buttercream fillings! Any extra macarons will be sent home with the birthday friends! In this fun, interactive party we will teach kids how to make pizza dough from scratch, proof yeast and knead dough. Then we will use our dough and toppings to customize and bake delicious pizza! The children will be immersed in the fun and festive creation of… cupcakes! We will make 4 cupcakes to bring home in a cake box — perfect to show off and share! We will create a cupcake to use for the birthday cup"cake" and sing happy birthday. The 4 cupcakes we will be creating to bring home are: Red Velvet, S'more, Salted Caramel and Lemon Meringue cupcakes. We’ll toast to the celebrant with a choice blueberry or chocolate chip scones and cream puffs, We will also make two types of tea sandwiches (choice between egg salad, chicken salad, cucumber, ham + cheese, or peanut butter + jelly) and iced or hot tea. Enjoy a Birthday Breakfast with these kid favorites: Blueberry Muffins, Belgian Waffles with fruits and made from scratch whipped cream, Maple Glazed Bacon and your choice of Fruit Smoothies or Hot Chocolate! In this class we will create a Fiesta Taco Bar with all the fixings. We will make our own tortillas and our own lime flavored soda. For dessert we will decorate cactus shaped sugar cookies for eating and taking home! We will make a variety of Asian favorites and sit down to our Dim Sum Birthday Feast! We will make and share: Crab Rangoon, Steamed Pork Buns and Sweet + Sour Chicken served with steamed rice. Birthday Packages are based on a per child price with a minimum of 6 children and a maximum of 12 children. PACKAGES ARE SHOWN HERE, but we are happy to customize the event and menu, just let us know!